Children (and adults) are often taught one of several versions of a snake poem to determine if a snake is venomous or not. “Yellow touching red: You’re dead”, “Red against yellow can kill a fellow”, or “Red touching black: Safe for Jack” are the most common versions of the chant, though others exist. While this is often a reliable way to determine if a snake is venomous or not, it is not a fail-safe. A good example of where this rhyme fails is with the coral snake versus the shovel-nose snake. Both snakes have yellow bands that touch red bands. Only a bite from the coral snake will be life-threatening. Though this mix up is harmless—the shovel-nose snake is seen as poisonous when it is really not—it still shows the old adages can be incorrect. This rhyme becomes deadly when the eastern coral snake, which holds true to the rhyme, is compared to the South American coral snake, which has black bands touching red bands. “Red touching black: Safe for Jack” is now a fatal mistake. 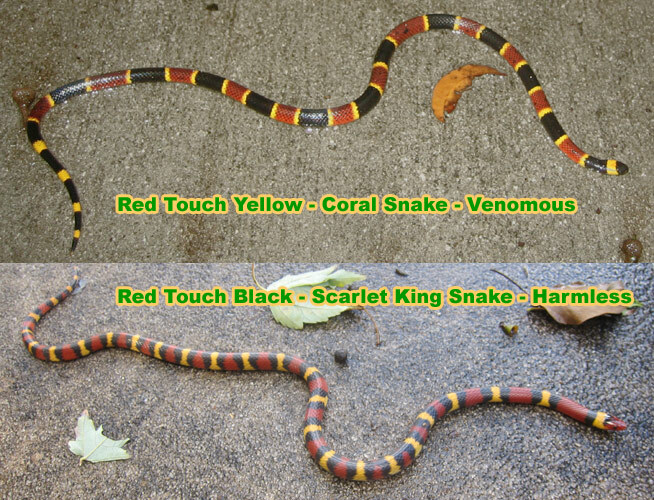 For more info that will help, read more about Coral Snake Look Alikes. True be told, there are no ways for an amateur snake hunter or an innocent hiker to tell if a snake is going to be venomous or not. It is true that certain dangerous snakes share characteristics, but there are just as many vipers that can appear harmless by traditional standards. The only way to determine a snake’s potential for harm is to know exactly what type of snake it is. This is determined by combining characteristics on a list of identification guidelines and then taking that knowledge and applying it to a field guide. Length, width, facial features, scale patterns, coloration, color pattern, and tail pattern are all ways of classifying a serpent. You cannot rely on color alone as the rhymes would imply. The coral snake is the culprit behind the nursery rhymes, though bites from these snakes are relatively uncommon in the modern world. Centuries ago, when more people were involved with farming, coral snakes were often found in gardens and farmed plots of land. The snake’s desire to be under piles of brush proved deadly when an unsuspecting farmer reached in and accidently grabbed the creature. Unlike vipers, which retract their fangs after a bite, coral snakes will bite and then hold on to their adversary. This is a hunting mechanism used on birds and other small animals to ensure the venom is delivered in full force. In North America, the rhymes can be considered accurate for staying safe. It may confuse a non-venomous snake for a venomous one, but there is not harm in that. It is when you travel to other regions in the world that you cannot rely on the poem. The best advice when you encounter a snake that has red, yellow, white, and black banding is to avoid it. There is no reason to have to handle the snake. If you are outside, move away. Coral snakes are not known to bite unless provoked or surprised. Removing yourself from the area should solve your problem. A snake with this coloration found in or around you home should be assumed to be poisonous. Handling an animal that could kill you is unwise, and professional assistance should be sought. There are no adequate coral snake repellents on the market. If one is in or near your home, it must be removed. Because the coral snake shares the similarities of non-venomous snakes, it is a good example of why the old, reliable tricks aren’t so reliable after all. If the color doesn’t confuse you, the fact that the coral snake has a round head and round pupils, will. Most poisonous snakes are thought to have triangular heads and slit pupils. As you can see, going by those common assumptions will also land you in a dangerous situation. The bottom line is there is no fool-proof way to easily or quickly identify a venomous snake from a non-venomous one. Can you tell if a snake is dangerous just by using a poem? The poem to identify coral snakes is not as useful as simply looking at photos and memorizing what the snake looks like. For more information about snakes, go to my Snake Removal - How to Get Rid of Snakes home page.